After the events of the first film, the denizens of Bricksburg are besieged by alien invaders from the planet Duplo. The invasion is repelled, but innocence is lost – that is, young Finn struggles to find common ground to play with his little sister Bianca. Five years later, Bricksburg is no more. Now, it’s the bleak landscape of Apocalypseburg. All of your favorite characters from the first movie have gone the full Mad Max – Lucy (Elizabeth Banks, “The Happytime Murders”) stares broodingly across the blasted landscape. Batman (Will Arnett, TV’s “BoJack Horseman”) has become a warlord (although he’s as self-centered as ever). Unikitty (Alison Brie, TV’s “G.L.O.W.”) is a fire-breathing beast. Pirate MetalBeard (Nick Offerman, “Bad Times at the El Royale”) and spaceship-obsessed spaceman Benny (Charlie Day, “Hotel Artemis”) are also accepting of their bleak new world. Only Emmet Brickowski (Chris Pratt, “Jurassic World: Fallen Kingdom”) remains untouched by the creeping dystopia – he remains his ever-cheerful self, even building a colorful new house in hopes of living there with his best friend Lucy. But the invaders return – specifically, General Mayhem (Stephanie Beatriz, “Half Magic”). The General comes from the Sistar System and is seeking to bring the leaders of Apocalypseburg back to her home planet in an effort to initiate a matrimonial event. Emmet inadvertently helps the General’s cause, leading to Lucy, Batman, Unikitty, MetalBeard and Benny being whisked away. Looming over everything is the threat of Our-Mom-Ageddon, a world-ending event that seems to be creeping ever closer – and no one knows how to stop it. The shape-shifting Queen Watevra Wa’Nabi (Tiffany Haddish, “Nobody’s Fool”) seeks to marry the leader of Apocalypseburg and bring the two worlds together. Despite the doubts expressed by Lucy, the rest of the group is enamored of the queen and what she has to offer them. 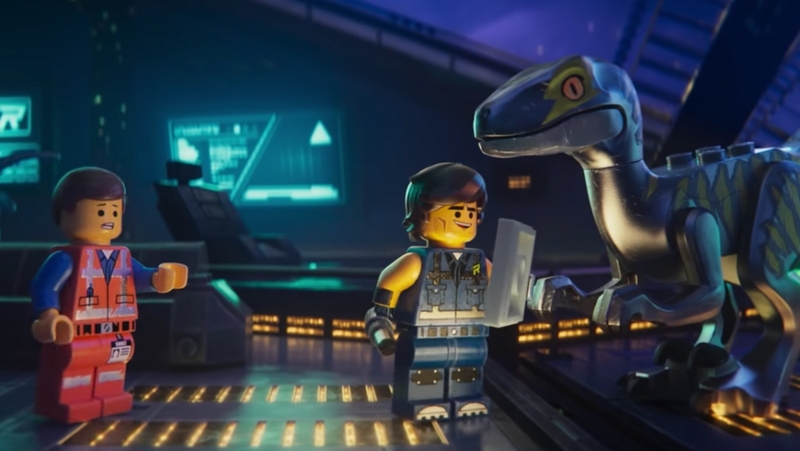 Meanwhile, Emmet is trying to rescue his friends, but in the process, he winds up encountering a roguish adventurer named Rex Dangervest (also voiced by Pratt). Together, Emmet and Rex undertake to track down and rescue Emmet’s friends, but Rex tells Emmet that his usual happy-go-lucky optimism isn’t going to cut it. Does Emmet need to change to save his friends? Is he even able to change? And what happens to everyone if he does? “The Lego Movie 2” doesn’t reach the heights of its predecessor. That’s mostly due to the absence of the emotional impact created by that first movie’s big reveal – this new story simply doesn’t have the same heft. And that’s OK – it’s still a good movie. It has the same sort of smart, pop culturally-savvy vibe of the original, thanks to Miller and Lord; Mitchell does a fine job taking the directorial reins. “The Second Part” checks a lot of the same boxes as that first film. There’s a ton of clever wordplay and some killer songs (Jon Lajoie wrote some bangers for this one). There are sharp, intelligent references throughout. And there’s a wonderful meta-commentary on action heroes in general and Pratt’s last half-decade of work in particular. Yes, some of the emotional impact is lessened – you won’t feel as many feelings – but it still works. It’s still super fun, and that’s what matters. The voice ensemble is uniformly excellent. Pratt is at his dorkily clueless best as Emmet and super action hero-y as Rex. Banks is great as Lucy. Arnett continues to slay as Batman. Offerman, Brie and Day are less prominent this time around, but they all have moments to shine. Haddish is outstanding as Queen Watevra Wa’Nabi, capturing just the right amount of ambiguity (and absolutely CRUSHING her big song). But everyone is awesome, including those in cameo appearances: Channing Tatum, Jonah Hill, Jason Momoa, Cobie Smulders, Richard Ayoade, Ben Schwartz, Ike Barinholtz, Ralph Fiennes and – last but not least – Bruce Willis as Lego Bruce Willis. “The Lego Movie 2” is a wonderful time at the movies. While it doesn’t quite hit the heights of the original, it’s a fantastic experience in its own right. Funny and clever with killer tunes and a few poignant moments, it’s a first-rate time at the movies. Turns out, everything is STILL awesome.